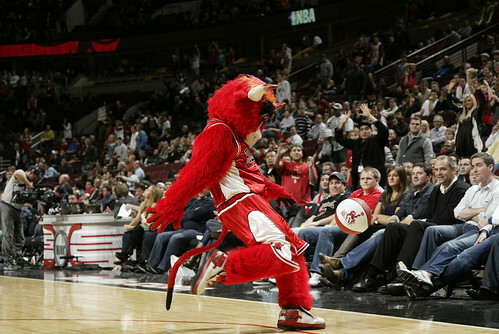 Madison Square Garden caved in the other day, but it turns out it was the Bulls having the roof fall in on them. 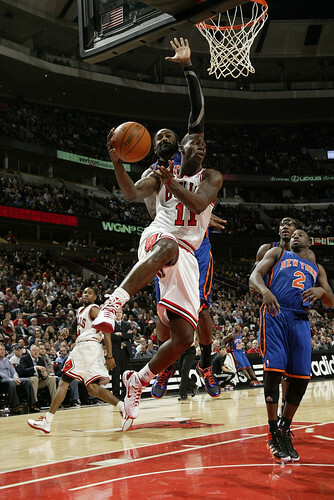 It was in the form of an astounding display of three point shooting Thursday by the New York Knicks, who were 16 of 24 on threes (they shot 42 percent on twos) and led from the middle of the first quarter on and defeated the Bulls 120-112. “I don’t think I’ve ever played against a team that shot that well as a team,” said Kyle Korver, who had 18 points off the bench in hitting four threes of his own. “Maybe Orlando once or twice. 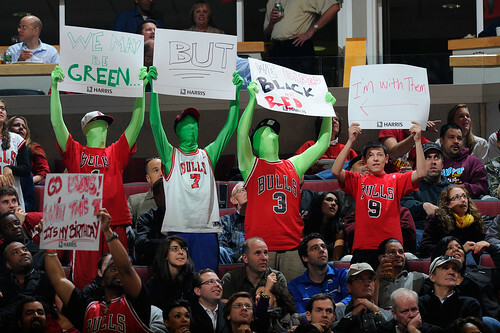 They shot well, but it was our fault for giving them so many wide open threes. And once they made them they had their rhythm. Though it didn’t seem like a bad strategy coming in as the Knicks were shooting 29 percent on threes in their 1-2 start as both teams now are 2-2. Though the lack of defensive attention turned out to be a footnote and the first mini crisis for Bulls coach Tom Thibodeau. Here’s the situation that had fans in the sold out United Center chanting unusually in the fourth quarter for the coach to put Derrick Rose back into the game for the last nine minutes. This being after Rose was magnificent, at least on offense, getting 24 points, a career high 14 assists and just three turnovers in 35 minutes. But with 9:31 left, a game in Boston Friday, the Bulls trailing 104-87 and the Knicks 14 for 19 on threes at that point after three more wide open ones to open the fourth, Thibodeau yanked Rose and never inserted Joakim Noah, seemingly for the night. Basically, Thibodeau was using the routine coach’s move not only to give his starters a break in what seemed a blowout loss with a back to back ahead, but also sending a message to his starters that their defense wasn’t good enough. Though Rose and Noah, the latter with 12 points and 13 rebounds, were having big games and Rose had one of those stunning highlight two hand slams early, Thibodeau felt the defense was sloppy and it was time to try something—and someone—else. And it worked, sort of. A group of C.J. Watson, Korver, Taj Gibson, Omer Asik and Ronnie Brewer went on a 10-0 run to send the Knicks into a timeout after a Korver 22 footer with a nine point lead at 108-99 with 4:48. 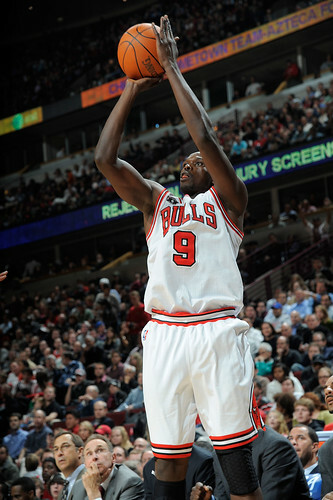 Time to bring back a rested Rose, Noah and Luol Deng, the latter with 17 points? 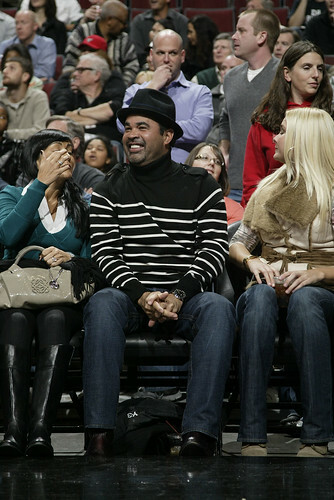 Thibodeau sent the same group back and they got Ronny Turiaf to force up a bad miss. But Watson, one of seven and now shooting 36 percent, missed a 20 footer. Danilo Gallinari, who came in shooting 18 percent on threes, hit his fourth straight three as he scored 24 and was killing the Bulls with transition threes. But Korver answered with his third three. Still nine with 3:41 left. No movement on the bench. Wilson Chandler drove for a score, but Taj Gibson, who was the Bulls best interior threat with 18 points and 10 rebounds, went hard and was fouled and made two. Back to a nine-point deficit with 3:04 left, but time was running out. 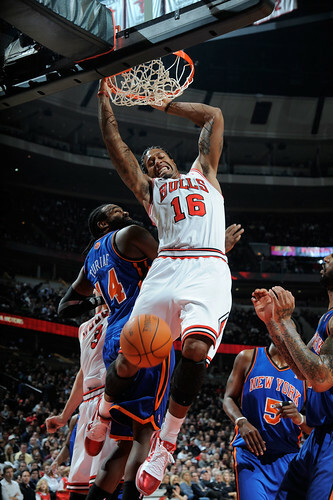 Amar’e Stoudemire, who had a quiet night with 14 points on five of 21 shooting and fouled out, missed on a dunk attempt and the Bulls had a chance to cut it to seven with 2:50 left. 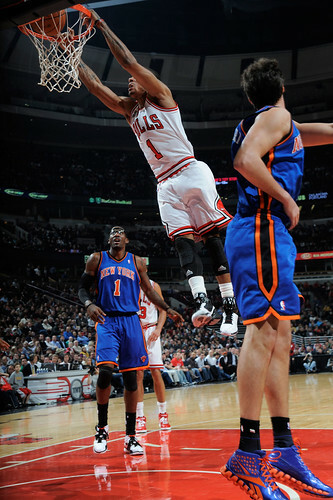 But Rose, who the Knicks could not stop, sat motionless on the bench. 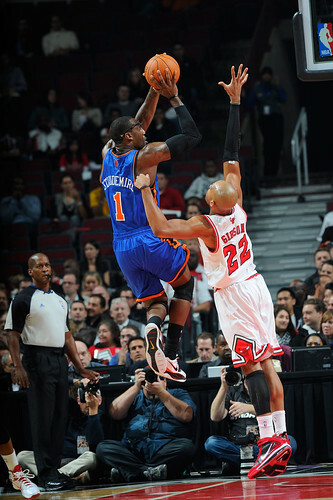 Gibson was blocked, and Ray Felton scooted the other way and hit another Knicks’ three for a 116-104 lead. Korver added his fourth three as the clock ticked just under two minutes, but it was a waste of a heck of an offensive fourth quarter, 55.6 percent shooting with Korver getting 13 in the fourth, as it was too far to come back with that group with barely over a minute and a half left. Which raised the question from everyone, including the TNT national broadcasters doing the game and the fans: Where the heck were your two best players in a winnable game situation, down less than 10 with just under five minutes left and at home? 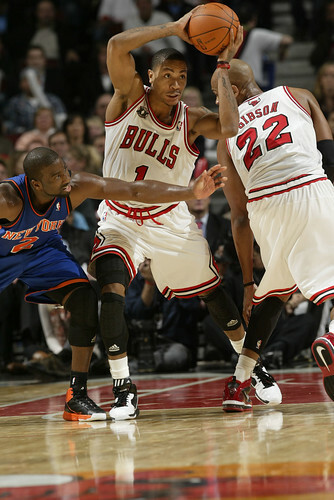 Let me say I would have gone back to Rose and Noah and taken my shot given the Knicks might have been tiring. I thought they got a break when their game with the Magic Tuesday was canceled because asbestos in the roof of the world’s formerly greatest arena, Madison Square Garden, had collapsed and rendered the arena unusable. Thus the Knicks came in not having played since last Saturday and obviously more lively in their legs. But it was a fast paced game, which the Knicks play, and this early in the season with more pressure in the fourth quarter perhaps those shots start coming up short. 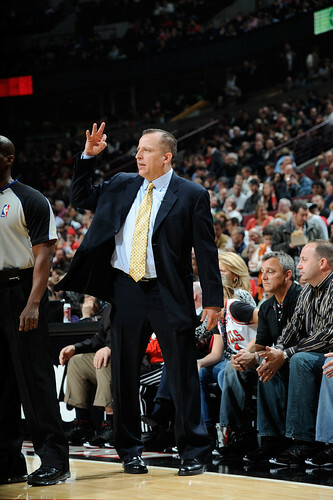 Thibodeau didn’t hesitate and wasn’t apologetic. He said he thought about bringing them back, but decided given the lack of effort toward the three point line and the fact that second unit, much maligned, was doing well, he’d ride them the rest of the way. He clearly was one of the few who would have done that, but his was the only vote that mattered. And it was to his credit, no matter what anyone may think, that he was strong in his belief and stuck with it. Though it clearly was an unpopular decision with the fans and media, it may have been a subtle bonus for Thibodeau as the players rallied around him afterward. So perhaps in some respect it was a victory for Thibodeau so early in the season and still without Carlos Boozer to have his players rallying for him like that. 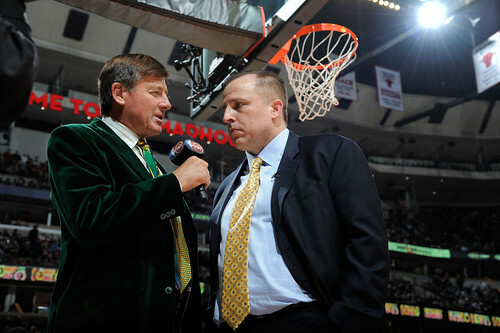 And so the Bulls move on to Boston for Thibideau’s return to his native state and where he picked up his championship ring as the Celtics defensive coach. They go seemingly without internal discord, but still with some major personnel issues hanging over the team. Because without Boozer—it can’t be said enough—they have difficulty going inside and despite the late comeback, the reserve unit again put the team in an early hole. That was after a wild 34-30 Knicks first quarter in which the Knicks were five of seven on threes and Rose stunned the building after getting burned by Douglas by spinning by Douglas, getting his both hands over his lead and powering past Gallinari at he rim for a two handed slam. When Noah dunked on a Rose pass a moment later it was 26-26 with about two minutes left in an entertaining first quarter, if not to Thibodeau with the Knicks scoring. But the Bulls essentially lost the game to open the second quarter when Thibodeau went to a group of Brian Scalabrine, James Johnson, Omer Asik, Deng and Watson. 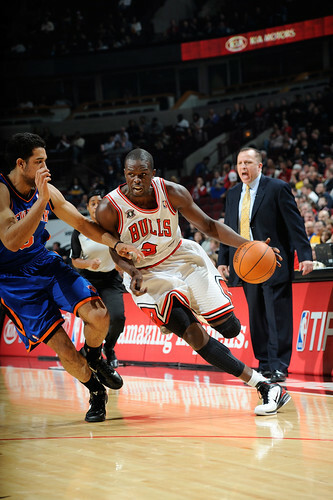 Though Deng can score, it’s more off the action of others. Watson hasn’t been able to run the team and has looked to shoot more, and that unit went stale as the Knicks hit them with a 10-2 run to make it a 12-point lead and it was up to 15 before Rose and Noah began to settle things down. 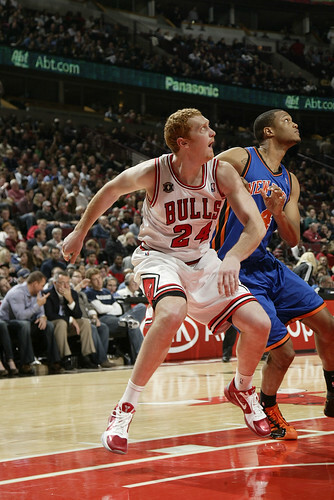 The Knicks also victimized the Bulls playing two small guards, Douglas and Felton for their quickness while the Bulls couldn’t take advantage on the other end because their primary shooting guards, Keith Bogans and Ronnie Brewer don’t specialize in posting up or backing down smaller guards and play more a face up game. 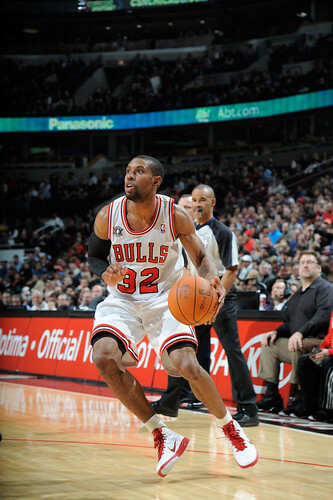 Plus, you can’t keep coming back from those kinds of deficits as the Bulls did in beating the Pistons. The Knicks are a better team this season, stronger defensively with Turiaf and Felton and more versatile with Stoudemire, even more as a threat as he was Thursday. 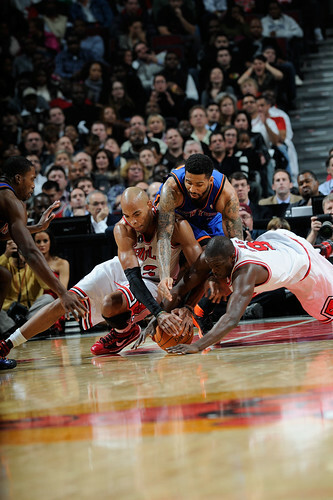 The Knicks with their speed and pushing the ball then began to get the Bulls scrambling back in defense and fouling as the Knicks took a 21-point lead and led 70-52 at halftime. The Bulls began to control their shooters better after halftime and got within 10 until Rose opened the fourth with Johnson, Deng, Asik and Korver and it got out of control early and Rose left and Noah never got in during the fourth. Clearly Rose has to stay out on the floor more with Watson’s deficiencies, at least for now, and Thibodeau did lean that way in starting Rose to open the fourth instead of resting him for later in the game. But I thought that reserve group to open the second quarter at least needed Gibson, whom the Bulls were going to successfully to open the game, as there was no one who could really create a shot or make a play in the post. The Bulls roster without Boozer doesn’t have much flexibility with players who can create, and Johnson was one of five and got a quick hook early in the second when that second unit struggled. 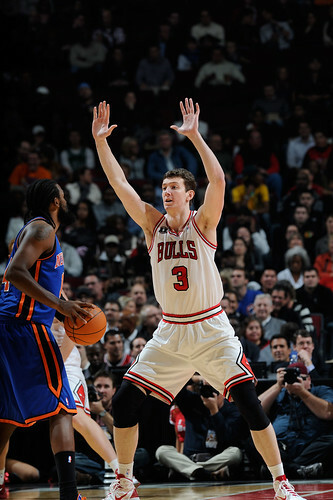 Still, the Bulls shot 51.9 percent, were nine of 19 on threes, outrebounded the Knicks and had more points in the paint, though again a troubling 20 turnovers for 26 points and sent the Knicks to the free throw line 29 times. It’s still a work in progress, as the coaches like to say at this time, though any crisis seemed averted.